Looking forward to spending time in the Mountains! So it’s off to the the French Alps for some last minute skiing! Staying here at a place called Secret Chalet! Located in the award winning village of Samoens (Coq d’Or – as one of France’s prettiest villages). The Secret Chalet has got some of the most awe inspiring views in the world. All the accommodation in Samoens is picture perfect but if you ski then you couldn’t find a more amazing part of the world. 265km of Fantastic skiing and the most family resort. 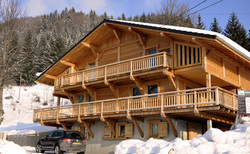 Less than an hour from Geneva check out the website Chalet Samoens for more info about it. Beautiful chalet you have. I would love travel to this area of France, so I will keep it in mind or recommend to anyone who may be traveling or skiing in the area.